St. Bartholomew was one of the twelve apostles with Jesus during his earthly ministry. He is mentioned in the three synoptic gospels, but not described further; many scholars believe he is also included in St. John's gospel under the name Nathaniel. The lack of description in the gospels doesn't mean he was unknown or forgotten. In fact, because of responses to intercessory prayers made to him, he became well-known for his prowess as a healer of bodies and souls, during the Middle Ages. In Rome, there is a small boat-shaped island in the Tiber River, called Tiber Island, which was the site of an ancient temple to Aesculapius, the Greek god of medicine and healing (the staff of Aesculapius is used as the symbol of medicine in the modern profession). A basilica for St. Bartholomew (see photo, below left) was built on the site of that temple in the year 998 by Emperor Otto III and is known as San Bartolomeo all'Isola (St. Bartholomew-on-the-Island). The ancient temple used to have a spring of sacred medicinal waters, which is memorialized in the current structure. The basilica was most likely built specifically to house the relics of Bartholomew (it was briefly dedicated to St. Adalbert who had been a friend of the emperor, but the dedication was changed when the relics of Bartholomew had arrived). 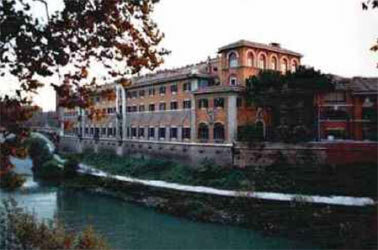 On this small island there is one other structure, an ancient medical institution, St. John of God Hospital (also called Fatebenefratelli Hospital) built in 1548 (and extensively renovated in the early 1930s). The religious order Fatebenefratelli-Brothers Hospitallers of St. John of God-was inspired by their patron Saint's charitable activities for the sick and poor, and the order was formally recognized by Pope Pius V under the rule of Augustine in 1572. This order also founded numerous hospitals in Italy, Spain, and France. The connection of St. Bartholomew's name to medical institutions, especially hospitals, is best illustrated by the story of St. Bartholomew's Hospital in London, which we can trace back to the healing accomplished at St. Bartholomew's Basilica in Rome for a visitor there from England named Rahere (his full name appears lost to history; see statue, below). Rahere was a courtier of King William II (1087-1100) and his brother and successor King Henry I (1100-1135). While he was on a pilgrimage to Rome, he contracted malaria and was nursed back to health at the Basilica of St. Bartholomew by brothers of the St Augustine order. 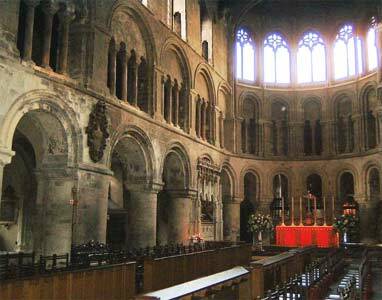 It is said that he had a vision there of St. Bartholomew, who instructed him to build a hospital near London. 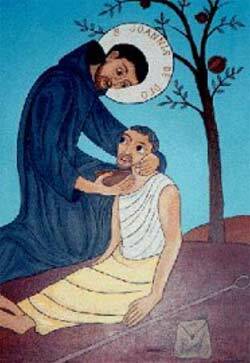 In gratitude for his healing and in response to the vision, he became an Augustinian and vowed to build the hospital. 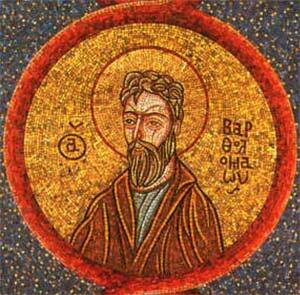 Supported by the Bishop of London, Rahere approached the King who gave him authority to carry out his proposals. 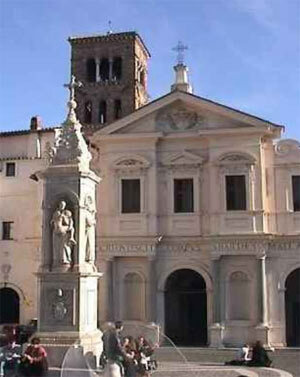 Returning to England, Rahere founded a church with Augustinian priory and a hospital in 1123. Except for the chapel in the Tower of London, the church (known as St. Bartholomew the Great) is the city's oldest place of worship; the hospital is the oldest in London. Rahere was the prior for 20 years until his death in 1144; he is buried in the church (in the sanctuary wall to the left of alter). Although never wealthy, the priory was at one time the largest in London and its church was larger than many cathedrals. When Henry VIII turned against the Papacy, the priory was dissolved (in 1539) and its outer buildings were destroyed; the remnants of the church were converted to other purposes, but have now been restored for worship as an Anglican-Episcopalian Church (see interior view, below right). When the priory was dissolved in 1539, the hospital's future became very uncertain because the closing of the priory took away its source of income and most of its staff. The people of London petitioned the king to grant this hospital-and three other hospitals-to the City of London. The king agreed to re-found St Bartholomew's Hospital and endow it with property and income. A number of famous physicians have contributed greatly to the hospital's fine reputation. 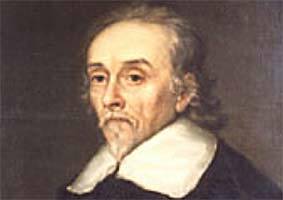 In 1609, William Harvey (above left), discoverer of the circulation of the blood and physician to Charles I, was appointed Hospital Physician; he worked there until 1643. In 1749, Percivall Pott, a leading surgeon whose name is given to certain medical conditions (such as "Pott's fracture") was appointed Hospital Surgeon. From his influence, St. Bartholomew's became the world's leading center for development of surgical techniques. In 1822, John Abernethy (who had been a student of Pott) founded a School of Medicine at St. Bartholomew's and became well known for his writing on medical subjects. The School of Medicine still functions today in new facilities, under the name of Queen Mary School of Medicine and Dentistry (see photo below, right). St. Bartholomew's ("St. Barts") is now a specialized hospital, carrying on work in cardiovascular diseases with its world renowned William Harvey Research Institute, and other fields: psychiatry, cancer, and preventive medicine. 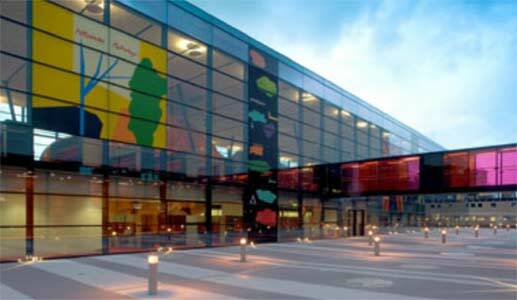 It still offers care for the poor and valuable emergency services. St. John Lateran Basilica (San Giovanni in Laterano) in Rome where statues of the 12 apostles are displayed in the central hall. O Jesus, Saint Bartholomew's greatest desire was to know the truth. When first informed about You, his initial reaction was, "How can anything good come from Nazareth?" But as soon as he met You, he wanted to become one of Your disciples. You said of him, "Here is a man in whom there is no deception." I ask him to pray against the deceptions that are influencing me and the people I know. Help us to experience Your affirmation when we are honest, give us courage to resist lying as a means of self-protection, and inspire our minds to recognize the truth when we hear it. 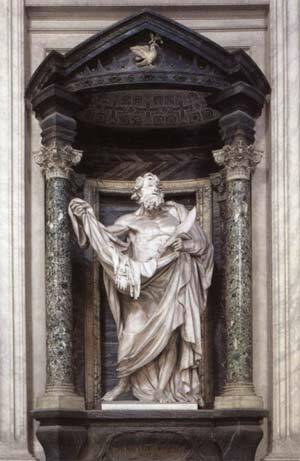 Saint Bartholomew, pray for us. Amen. Transfiguration Greek Orthodox Church in Lowell, Massachusetts. 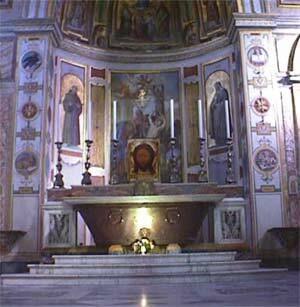 Tomb of St. Bartholomew in the Basilica on Tiber Island.